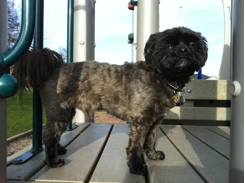 You are ready to adopt a beautiful little Shih Tzu from your local Shih Tzu rescue shelter. You have done your homework and learned all you can about the breed, what it requires to live a healthy, long life and you are all prepared to provide a happy home for a loving Shih Tzu. Since your appointment to visit the Shih Tzu rescue center is right around the corner, you may wonder what to look for when rescuing a Shih Tzu. Since there are some health issues that may arise during their lifetime, you will want to take a close look at each Shih Tzu at the shelter. Shih Tzu’s are generally a healthy breed that is well known for their potential for an above-average lifespan. However, there are times that some Shih Tzu’s may develop health issues due to heredity. Some health issues include eye problems, joint problems, misaligned teeth, renal dysplasia and respiratory issues. When you visit the Shih Tzu rescue shelter you will want to focus on signs such as thick discharge in the eyes, limping or whimpering when walking or running, rotten or misaligned teeth, skin allergies, skin blotches and behavioral problems. While behavioral problems are not necessarily hereditary, it is something to look into. Shih Tzu’s are generally non-aggressive and have a spunky, sweet and kind disposition. If you notice a Shih Tzu being aggressive or isolating himself from others, there may be potential for a possible behavior issue. Now that you know what signs to look for in a Shih Tzu, if you find any of these signs, it doesn’t mean it should deter you from adopting him. Most of these health issues are able to maintained throughout the Shih Tzu’s lifetime with veterinary care, which could either be temporary or long term care, depending on the severity of the condition. An eye infection can be cured quickly, but sensitive knee caps or other issues may require visits to the veterinarian office. If you are interested in adopting a Shih Tzu that shows any of the above signs of health issues, discuss it with the staff at the Shih Tzu rescue shelter. Usually the staff is highly educated to the specific breed it houses. Discuss your findings on the specific Shih Tzu of your choice. You can even contact a local veterinarian to discuss the long term care the dog might require throughout their lifetime. This will allow you to understand the dog’s needs and make sure you are capable of providing it with the proper care it needs. Finally, make sure that you are 100% sure you are ready for this responsibility. Even though Shih Tzu’s may have a few health issues throughout their lifetime, the issues don’t usually affect their span of life, which can reach up to 18 years. Now that you know what to look for in a Shih Tzu, visit your local Shih Tzu rescue shelter and bond with these bundles of joy and bring your new companion home today. You are ready to adopt a beautiful little Shih Tzu from your local Shih Tzu rescue shelter. You have done your homework and learned all you can about the breed, what it requires to live a healthy, long life and you are all prepared to provide a happy home for a loving Shih Tzu.